Experience the innovative interface of the Touch Bar in the late 2016 space gray Apple 15.4" MacBook Pro with Touch Bar. The system features a 2.9 GHz Intel Core i7 quad-core processor, 16GB of 2133 MHz LPDDR3 onboard memory, a 1TB PCIe-based SSD, four Thunderbolt 3 (USB Type-C) ports, a 50% larger Force Touch trackpad, a keyboard with a 2nd-gen butterfly mechanism, stereo speakers with double the dynamic range of its predecessor as well as improved bass, 802.11ac Wi-Fi, Bluetooth 4.2 wireless technology, and even a 3.5mm headphone jack. macOS Sierra is the installed operating system. Box Dimensions (LxWxH) 16.2 x 11.5 x 3.8"
15.4" MacBook Pro with Touch Bar (Late 2016, Space Gray) is rated 4.3 out of 5 by 111. Rated 4 out of 5 by ewessmanphoto from I like it so far. It is small and light. I hope it is powerful, but I haven't had a chance to put it through it's paces yet. It is taking a long time to migrate data from my previous MBP, install new software, and discover that some older programs aren't supported in OS Sierra. The USB C connectors are an extra step. I bought an adapter, but discovered that my external monitor does not work with it. Wacom does not support the driver for my older tablet, so I need to buy a new one. The maker of my RPG Keys couldn't keep up with Apple and Adobe, so I have to leave that awesome device behind. There have been challenges. Rated 3 out of 5 by Ben from Awesome Product...Various Issues The laptop is an awesome upgrade/replacement to the previous macbook pros, but various issues that have been well documented on the roll out including hard drive latency as well as serious battery issues. The new OS is awesome and new keyboard layout/buttons as well as the touch bar which on first review seems out of the way and useless, is becoming more useful with each time the device is used. Hoping Apple creates fixes surrounding the battery issues, but beyond that and figuring out a way to use all accessories via adapters for usb-c, which is proving to be a challenge, the device is awesome and would recommend it even given all the issues. Rated 5 out of 5 by Ryan from Great Price, big performance upgrade. First off, I upgraded to this particularly for the four USB-C ports now that the cables are easy to come by and hubs and adapters are no longer necessary. I can now plug in my SSD, 4TB Rugged drive, Card reader and power all at the same time. Speed and performance is a huge upgrade from my 2012 Retina MacBook Pro (2.7 i7, 16GB, 512GB). I absolutely love the new keyboard, large trackpad and have found the Touch-ID and Touch Bar very useful.? B&H's price was hands down the best available anywhere, even hundreds lower than a refurbished one from Apple. At this price I can still sell it later this year, if Apple comes out with a revolutionary new model in June!! Rated 4 out of 5 by DaveM from Very Fast But Initial Access Challenging This is a very nice computer, very fast processor and with the 1 TB SSD drive access is super fast with little waiting. Only caution it has taken me awhile to get up and running because of the USB type C ports. I couldn't do a lot until i got some crossovers. My suggestion would be you order these at the same time as the computer. I have some reviews where people are saying Apple dropped the ball by not having other ports but I disagree. The whole industry seems to be going this way so I think Apple is very forward thinking. This USB type C seems to be the new future standard so why put obsolete ports on a new computer. Rated 2 out of 5 by Philip from I wish I could leave a better review. I bought this computer to replace my Late 2011 Macbook Pro. Upon opening the shiny, perfect, Apple packaging I was gutted to discover the battery was dead on arrival and would not charge. So after taking it to Apple Genius Bar to verify, indeed - the battery was dead and failed the diagnostic. So I exchange it with B&H which was painless but cost me a week of time to wait for the new machine. Now I open the new machine and.. the left shift key consistently does not activate when pressed.? After reading the other reviews on this machine it seems either B&H got a batch of lemons or the entire 2016 production run is full of lemons. I'm contemplating returning it. I don't know if I want to risk another exchange and another lemon. I also don't know if I want to stay with Apple after this experience. Rated 5 out of 5 by RODRIGO D. from Awesome machine! I'm a professional photographer I recently purchased a new camera body and as of late I have been asked to shoot and edit video clips for clients as well. It only does this machine handle my new camera body's large files it also edits 4K video easily and allows you to use adobe after affects seamlessly. It's not a desk too but it's hands down the best option for anyone who does commercial video or photography this is the best road companion you could ask for. Rated 2 out of 5 by Tom from Too many downgrades This is my 4th MacBook Pro. In the past, every time I upgrade I find that the entire user experience is upgraded–better insides, better screen, better design, etc. This time, all of the usual improvements are spoiled by a few unacceptable downgrades. The shallow keyboard is unacceptable, and after a few weeks I'm still typing slowly with errors. The touch bar is a complete gimmick and annoying–after a while it turns itself off, so just to hit escape you need to first wake it up, then press it. I'm not a user experience design expert, but I believe ADDING steps is the opposite of improving UXD. And don't get me started on the thunderbolt 3 ports. I have to bring ugly, loose dongles around with me everywhere now. And I miss the magsafe charger which indicated when the battery was charging/full. That's gone now too. I upgraded because I needed a bigger SSD and improved specs for video/photo editing. And I'll admit that it's an incredibly fast and powerful machine. But due to all of these downgrades, I'm seriously considering selling this and going back to a maxed-out 2015 model– the last "good" MacBook Pro. Can I edit 4K video on Adobe Premiere with this machine? or should I go for a 2017 model? Can I ask to install sierra instead of high sierra? 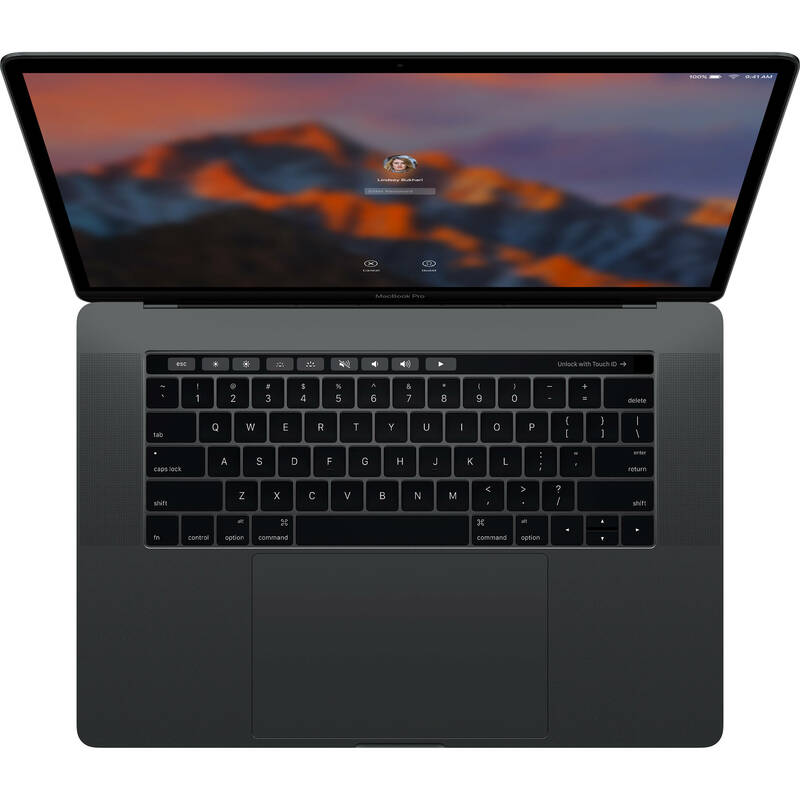 The Apple 15.4 MacBook Pro with Touch Bar (Late 2016, Space Gray) B&amp;H # APMBPTMLH430 will not downgrade to an OS older than the one it ships with. It will run High Sierra or higher. what is the color gamut? The color gamut on the 2016 Macbook Pro is very wide, at 91% of Adobe RGB and 87% of NTSC (it covers more than full sRGB). can you confirm specs on this build please? The previous answers to this question are accurate. I bought this machine as a replacement for a CTO 2014 MacBook Pro that was maxed out for late 2014. I purchased this machine as a replacement intending to pass the 2014 to one of my children and to save $1000 plus local sales tax under the cost of a similarly configured mid 2017 machine. The 2014 MBP was and is faster executing benchmarks and running common commercial applications than this late 2016 which is actually a CTO Apple spec. The discount received in my opinion was worth the slight concession I had to make regarding the raw processing speed of the device compared my earlier 15 macbook. The mid 2017 15 MacBook Pro has a newer processor version (Kaby Lake v Sky Lake) and is available in versions that run at a slightly higher frequency (but lower voltage - 3.1 v 2.9 Mhz) Also the mid 2017 has a slightly upgrade but almost identical 560 GPU v the 460 in the late 2016. The latter is purported to benchmark slightly higher than the former. The (undercounted) mid 2017 at 3.1 Mhz (Kaby Lake) processor frequency and 560 version GPU benchmarks and runs applications a tiny bit faster than the mid 2014 model I previously owned - but at $1000 great purchase cost at this particular time hence why I made this purchase from B&amp;H in the first place. All things equal I would buy it again. Hope that helps. Do they have financing options? We offer PayPal Credit. This is the the effortless way to pay without using your credit card. Simply select PayPal Credit at checkout, answer two simple questions and accept the terms. It's that easy. There is no separate application process. PayPal Credit offers flexible terms that allow you to choose to pay in full or over time. Take advantage of no payments and no interest for 6 months if paid in full by the promotion end date (orders over $250). Subject to credit approval. This is a brand new computer, factory sealed, directly from the manufacturer. Is Applecare available for this computer? Yes. When you add the computer to your shopping cart, you should see an option to add AppleCare. Please note that you can only purchase AppleCare with B&amp;H at the time of purchasing the Mac. Otherwise, you'd have to purchase from Apple directly after they run a diagnostic on your Mac. Asked by: Roberto Pedro A.
Todos los valores son en dolares americanos, estamos basados en Estados Unidos. Puede cambiar la moneda que se ensea en la parte de abajo al final de la pagina web.